Honey Butter is the perfect way to add a bit of sweetness to your breads. 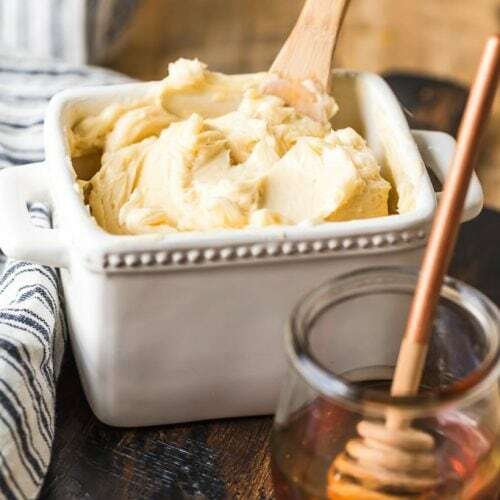 Use this simple homemade honey butter recipe on toast, on fresh dinner rolls, or on homemade crescent rolls. Once you know how to make honey butter, you’ll be eating it with everything! Honey Butter is an easy way to add a bit of sweet flavor to your favorite breads at breakfast, at dinner, or even for a quick snack! This honey butter recipe is my new favorite thing to eat. Bread and butter is a classic combination, but sometimes regular butter is just a bit too plain. 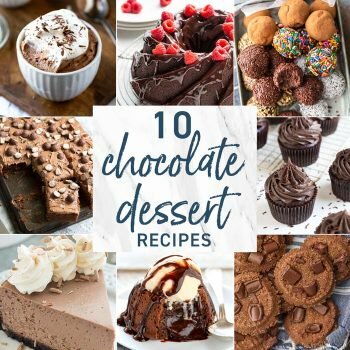 I love how this recipe adds just the right amount of sweetness into the butter to create a perfectly crave-able flavor. 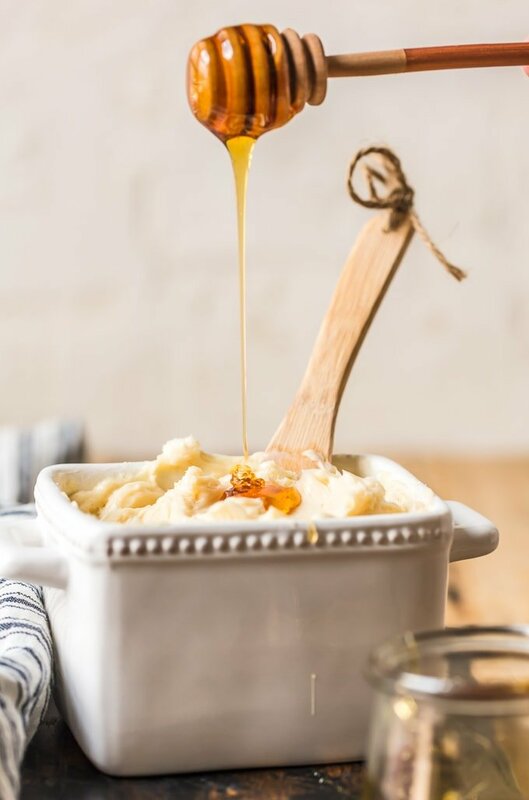 All you have to do to make this simple homemade honey butter recipe is mix honey and maple syrup into unsalted butter. It’s quick and easy, but the taste makes all the difference! You can make a good-sized batch of this butter to refrigerate, or even freeze it for future use. It’s kind of addicting once you taste it on fresh, warm bread. You won’t be able to stop eating it! This homemade butter is perfect for breakfast croissants, toast, dinner rolls, or crescent rolls. Or melt it into a bowl of oatmeal and YUM! The sweet flavor of this butter makes it feel indulgent and adds a bit of decadence to the simplest foods. Learn how to make honey butter with this simple recipe. You’ll love the sweet flavor on all your favorite breads! The idea of making honey butter might sound difficult, but this recipe is simple. We’re not making butter from scratch (I haven’t reached Pioneer Woman levels just yet), we’re just adding in the honey flavor and creating a light fluffy texture that is absolutely to die for. 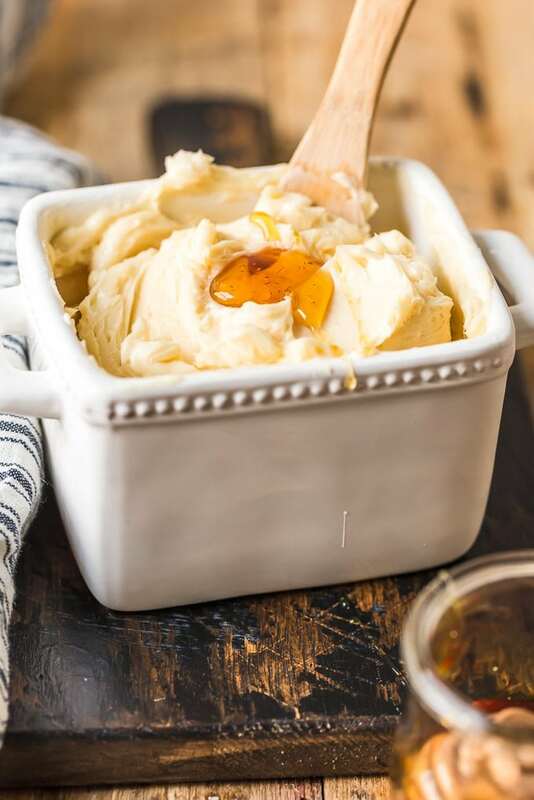 So as long as you have honey, maple syrup, unsalted butter, and a mixer, then you can easily make this honey butter recipe! Let it set in the fridge for a couple of hours before using it. Easy as that! Now you have sweet, light honey butter to serve at breakfast, dinner, or any time really. Once you’ve made the butter, you have to store it properly to make use of it. The butter will keep in the refrigerator for about 1 month (assuming you don’t eat it all before then). You can also freeze it for up to 6 months. You can simply move the butter from the mixer into a container with a lid and store it in the refrigerator. It will harden into the shape of the container, and you can dip into it whenever you use it. If you prefer, you can shape the butter into “logs” while it’s fresh out of the mixer. It will still be pliable at this stage, so you can wrap it in parchment paper and mold it into sticks or logs of butter. This light, creamy, sweet honey butter is the perfect addition to fresh, warm breads. It tastes amazing on any type of bread, so go crazy! I think it’s perfect for toast, croissants, and biscuits first thing in the morning. I love that simple kind of breakfast for easy mornings. This homemade butter is also ideal for dinner rolls. 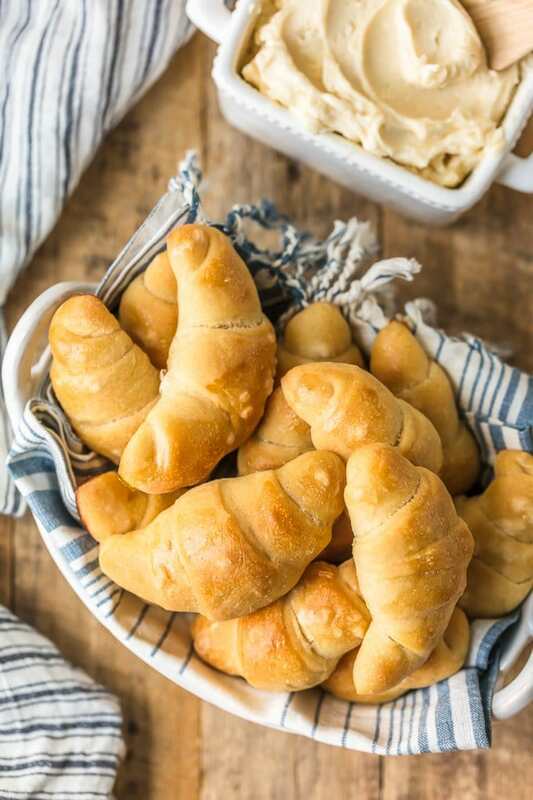 Specifically, homemade crescent rolls! 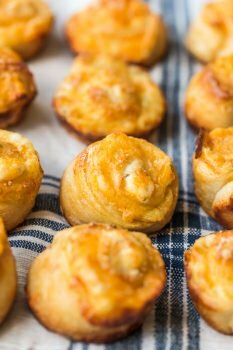 I made this honey butter originally to go along with these flaky, buttery crescent rolls because it seemed like the perfect match to me. They taste soooo good together, and they are such a great thing to serve with dinner or for breakfast. 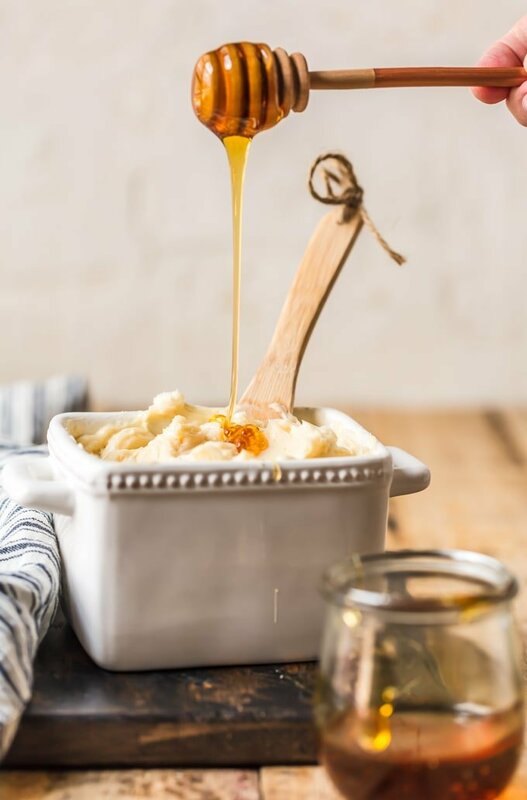 I’m so excited about this sweet and tasty homemade Honey Butter recipe! It’s so flavorful and adds just the right amount of sweetness to fresh breads. I can’t get enough of it, and I know you’ll love it too! See the recipe card below for details on how to make Honey Butter. Enjoy! 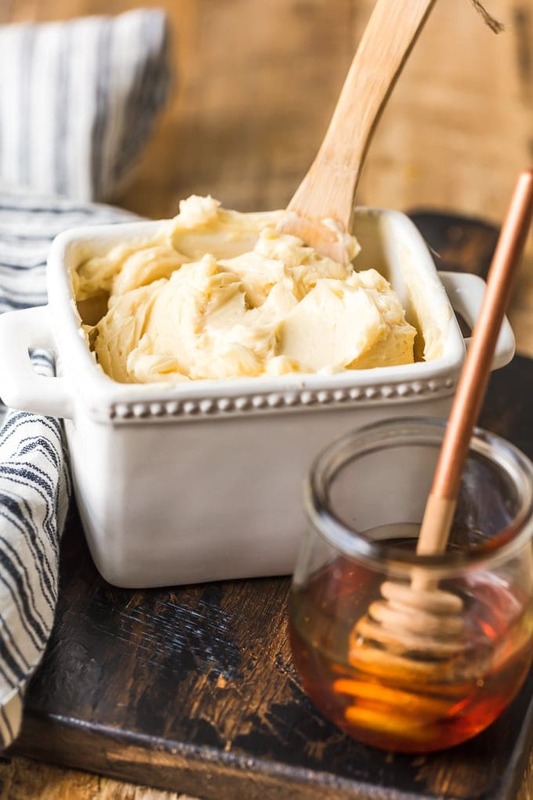 This homemade Honey Butter recipe is simple and sweet. 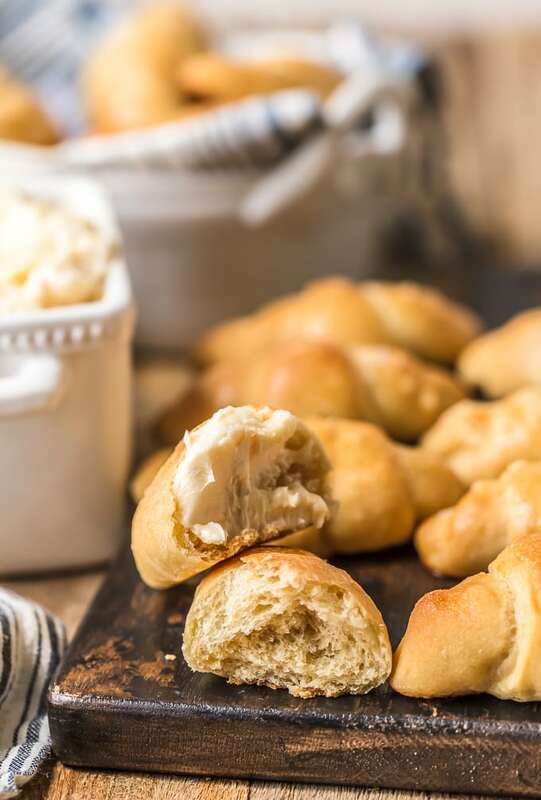 Learn how to make honey butter for all your favorite breads, from croissants to crescent rolls to biscuits! Cut the butter into 2-inch pieces and place in the bowl of an electric mixer fitted with the whisk attachment. Whisk on low speed to smooth and loosen the butter. Increase speed to medium and slowly drizzle in the honey and syrup. Add salt and turn mixer to medium-high speed. Whisk until light and fluffy, about 5 more minutes. Keep refrigerated, in an airtight container, up to 1 month. See *Notes for alternate serving suggestion and for freezing. *Note: If desired, place half the Honey Butter onto plastic wrap or parchment paper and shape into a log (Repeat with the remaining half of the honey butter.) Wrap tightly and refrigerate at least 2 hours before cutting. When ready to serve, cut into ¼-inch slices. **Note: The butter can be frozen up to 6 months if properly wrapped.